I have a new favourite café in Dublin! I’m not going to lie – I haven’t much of a notion how to go about this whole ‘food critic/restaurant review’ craic, but I sure as hell felt I had to say something about this place! I get the impression that The Cake Café, just off Pleasant’s Place (even the name of the STREET is inviting) and also accessible through Daintree’s craft shop on Camden Street, is probably not such a well-kept secret as it would have been a short while ago before it’s inclusion on Dublin’s ‘Fab Food Trail’, and generally widespread word-of-mouth praise it’s gotten from everyone I know who recognises it. 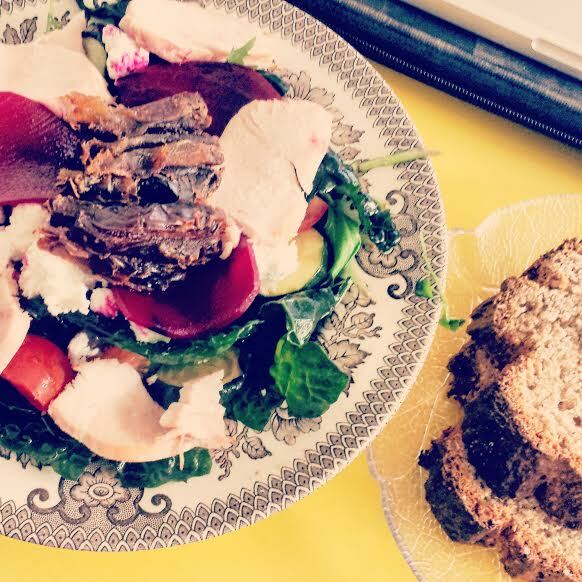 I arrived shortly before lunchtime and even then its’ cosy interior was bursting with life and the aroma of fresh Irish produce, homemade goods and an exciting freshly blended coffee that was leaving home in takeaway cups with the delightfully punny message ‘Cupán Will Ya? ?’ printed on them (I’d be lying if I said I’m not a fan of ‘The ol’ bitta’ Gwaeilga’”). Brian Dobson was sat in one corner sipping a coffee and looking slightly out of place while a few other well-to-do looking clientele in suits and blazers clustered around some of the rickety seats outdoors, & I noticed some wine glasses and attractive looking craft beers nestled amongst the freshly squeezed glasses of juice and mugs of tea. My kinda’ place, I thought. I trudged in with my yoga mat slung over one shoulder and a laptop in my bag, navigating my way through the tightly packed and populated little tables, looking for somewhere new to do a bit of work and hoping against hope I’d fit in with some of the other ‘foodies’ and lunchtime coffee-lovers who began arriving as the dainty little china-clock on the wall ticked closer to 1pm. When I say this place does everything, and does it well, I mean it. Divided into a ‘Breakfast’ and ‘Savoury’ section, with options of sides and of course the all-important ‘Cakes’ at the end, the menu itself as a whole is not extensive. As I sat and downed my coffee however, I couldn’t help but notice how mouth-wateringly tasty and also most importantly healthy everything that was being served to many clearly very regular customers looked. The staff bustled around cheerfully, acknowledging some by name and others simply with a warm smile and gesture of the hand to an empty table. I gave in and asked for a menu, eventually deciding on the ‘Chorizo and Goats’ Cheese Salad with Homemade Brown Bread’, substituting the chorizo for chicken, and biting my tongue hoping I wouldn’t end up with food envy as the little girl beside me was served granola with natural yoghurt topped with peanut butter and banana. (The staff get bonus points for being so sound about this minor adjustment to my order). While the child’s bowl of yoghurt and peanut-buttery goodness had me already pre-planning my breakfast for the following morning, the arrival of my meal sufficiently distracted me from thinking ahead so much, and I was forced back to the moment to devour this fantastic concoction of flavours, nourishment and colour which also scores triple bonus points for being super super healthy and satisfying. I usually despise dates, but these ones were warm and gooey and complimented the rest of the ingredients incredibly well – I thought I was hilarious messaging a friend a picture of it and organising a ‘date’ there again next week. Before I get too excited about the (fabulously yummy) Lunch and Breakfast menus, I must mention the cakes. It is, afterall, in the nature of a ‘Cake Café’ to serve cake. ‘The Cake Shop’ people (because what else would we call them) pride themselves on ‘making and delivering cakes to order within 24 hours’, and surely enough I witnessed a steady flow of orders and cake-for-money transactions over the counter taking place while I munched on my beautifully served lunch. Not only pre-ordered and entire cakes, of course, but slices, buns and tarts too. While the variety looked fabulous, and certainly everyone around me seemed extremely satisfied with their choice of tartlets, I actually didn’t taste any of the cakes that first day. I couldn’t decide, and after my decadent (and very satisfying) lunch, I simply didn’t feel the need to indulge. If the other food is anything to go by though, I thought, it’s definitely something I need to try soon. Price was something I had been concerned about, given the seeming exclusivity of this oasis of nourishment, yet the quality of the food and the atmosphere of the place in general really sent any qualms I’d had flying with the iced butterflies which decorated some of the cupcakes. I lingered awhile after finishing my meal, observing mostly, but also succeeding in getting some work done – one thing I noted was that the eggs and also the roasted vegetables seemed to be very popular choices. The fact that they serve wine, prosecco, and a selection of beers and cocktails really just put the icing on the cake (wouldn’t be a cake shop review without that sentence!) for this place, and I made a mental note to come back some evening for a tipple and some cake before heading out on Camden Street. Returning the following day to grab a coffee and takeaway piece of lemon yoghurt cake (devine in it’s own right), I may have emitted a momentary ‘fangirl’ squeal of delight as I spotted Bressie on the opposite side of the café. Yep. Bressie. Fairly sure he caught me looking, too. Bressie likes cake. Therefore, I like cake. Don’t we all?! If that’s not enough to persuade you to come to The Cake Café soon, I don’t know what is.